Made popular in 2002 by Bev Galeskas and Sarah Hauschka, the magic loop method enables you to work projects of small circumference on one long circular. 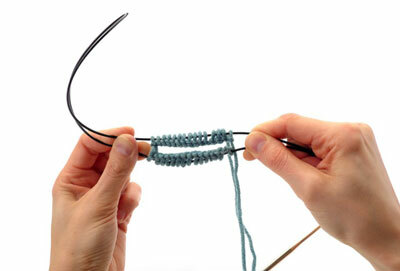 With this method, you pull out a loop of cable to divide your stitches, usually into two equal parts. 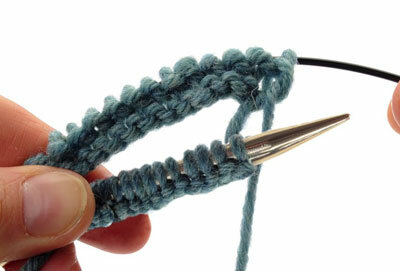 Once you divide your stitches, you can use the free needle tip to knit across half of the stitches. You then rotate the project and work the remaining stitches. 1Slide the stitches to the right. They should all be positioned on the cable portion of the circular needle. 2Lay the work down on a table in front of you and take a look. The yarn tail and working yarn should be on the left, and the first cast-on stitch should be on the right. 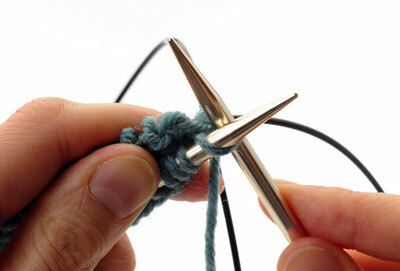 3Adjust your cast-on edge so that it is not twisted around the needle. 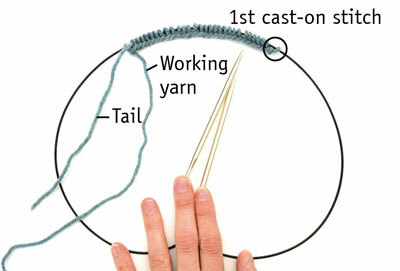 Make sure that the bottom edge of the cast on runs smoothly along the cable without looping over the needle. The end of the needle with the yarn tail and working yarn should be on the right and the end with the first cast-on stitch is on the left. 5Count across half of the stitches. Carefully separate the stitches at this spot and pull about 6 to 8 inches of the cable through the opening. Your stitches should be divided in half. 6Fold your work in half so that both needle tips are pointing to the right and the section containing the first cast-on stitch is in front (facing you). Again check that your cast-on edge is not twisted around the needles. 7Position the working yarn so that it runs up from the last cast-on stitch to the outside of the project. The working yarn should not pass through the center of the project. 8Hold your work in your left hand and slide the front set of stitches to the right until they are resting on the needle. 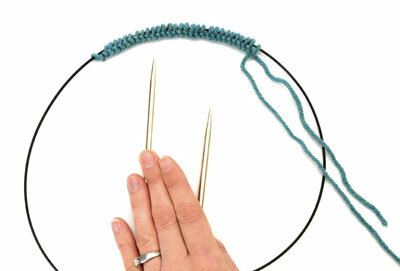 Then take the empty back needle in your right hand and bring it into position to knit. 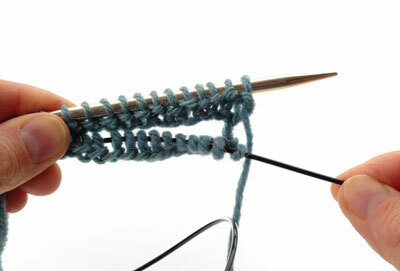 9Knit into the first stitch on the left-hand needle to join your work. Then knit across the remaining stitches on the left-hand needle. 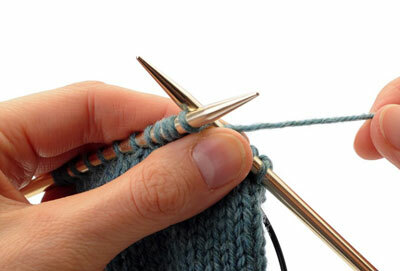 Keep your first stitch or two tight to prevent a gap from forming between your needles. 11Slide the front set of stitches to the right until they are resting on the needle. Then slide the back set of stitches to the left so they are resting on the back portion of the cable. Always be sure to keep a loop of cable between your two sets of stitches. If you should lose this loop of cable, simply divide your work in half again by pulling the cable through the stitches at the appropriate spot. 12Using the now-empty back needle, knit across the front set of stitches. Remember to keep the first stitch tight. When you reach the end of these stitches, you will have worked one complete round. Note the presence of your yarn tail, which indicates where your new round begins. 13Use a stitch marker to indicate the beginning of your round if desired. 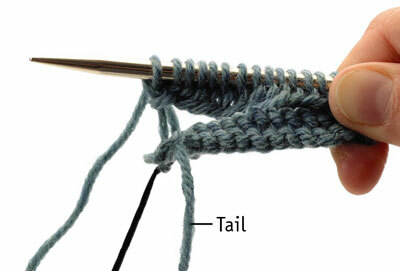 Although your yarn tail will always help you identify the end of the round, it becomes harder to spot as you knit more rounds and the tail gets farther away from the needles. 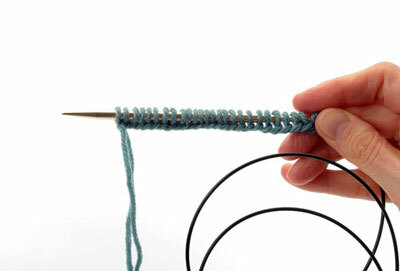 It is therefore a good idea to use a stitch marker to more clearly indicate the end of the round. You can insert a locking or split-ring marker directly into the last stitch of the round and move it up every 20 rounds or so as needed. If you wish to use a solid-ring marker, place it before the last stitch of the round to keep it from falling off. 14Stop and check again that your work is not twisted. Verify that the cast on runs smoothly along the bottom edge of your work and does not loop over the needles at any point. 15Rotate your work again so that the stitches you are going to work next are facing you, slide the front stitches onto the needle tip and the back stitches onto the cable, and work across the front set of stitches. 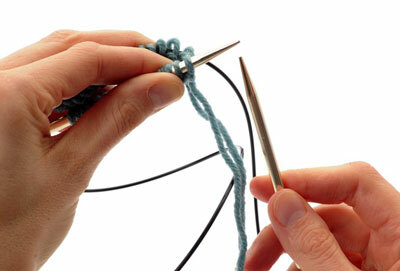 Continue on in this manner, rotating your work and arranging your stitches, after you have worked each side. Make sure that you are knitting around the outside of the tube you are creating. The right (knit) side should be to the outside and the wrong (purl) side to the inside. To correct this, just turn your work right-side out and begin working around the outside of the tube. 16When your project has reached the desired length, bind off. 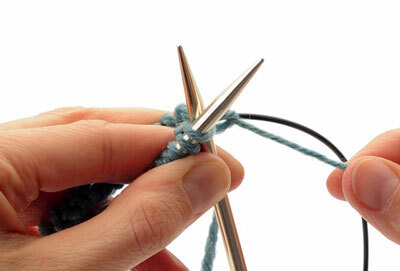 The greatest benefit to the magic loop method is that you can knit many different circumferences with one long needle. This eliminates the need to buy needles in different lengths; one 40-inch circular needle can replace a 16-, 24-, and sometimes even a 32-inch needle for many knitting projects.